The world’s deserts receive a tremendous amount of solar exposure – in fact, it’s estimated that if just 0.3% of the Saharan Desert was used for a concentrating solar plant, it would produce enough energy to power all of Europe. Architect and technologist Otto Ng has designed a large solar canopy called the Powerscape that is capable of generating energy while serving as a functioning habitat. While the canopy has the potential to be a cheap and practical system for harnessing solar energy, the concept of placing a giant canopy over desert areas does raise a few questions. Ng states that by 2050, the world’s oil supply will decline to 1/3 of what it is today. What he proposes instead is to construct over 10,000 km2 of Powerscape – a solar-collecting infrastructure that would be constructed across the arid desert in order to provide energy for the Middle East’s economy and the rest of the world. Of course, the main problem with Powerscape is its sheer size. Unlike traditional power plants, it requires a massive amount of space. However Ng argues that Powerscape will allow for the desert landscape to be used with the canopy sheltering the ground from the harsh direct sunlight that will be captured for power supply. He theorizes that as a result, transformation in biological development, meteorological activity and geological phenomena will be inevitable and that the reduced heat and evaporation rate will make desert regions more habitable for human, animals and plants. While it sounds like a risky form of geological engineering, the energy production benefits are clear. Constructed with layers of solar-gathering material, the Powerscape will be organized to form “Strata” of temporal conditions to be stretched across the landscape. What do you think? A genius design or a risky strategy for desert regions? It seems like an interesting proposition, though it would depend on a number of factors - first and foremost, just how much energy the solar canopy is verified to collect. Another factor might be a matter of moisture collection due to the temperature differential created. I don't think it would be feasible to cover such a large area with current technology and economic impacts; however, if 100km-sq areas were established in the desert using the canopy as agricolonies, and melting polar regions were partly harvested to help irrigate them, it might help improve food security and provide sustainable living in those locations. The world's deserts receive a tremendous amount of solar exposure - in fact, it's estimated that if just 0.3% of the Saharan Desert was used for a concentrating solar plant, it would produce enough energy to power all of Europe. Architect and technologist Otto Ng has designed a large solar canopy called the Powerscape that is capable of generating energy while serving as a functioning habitat. 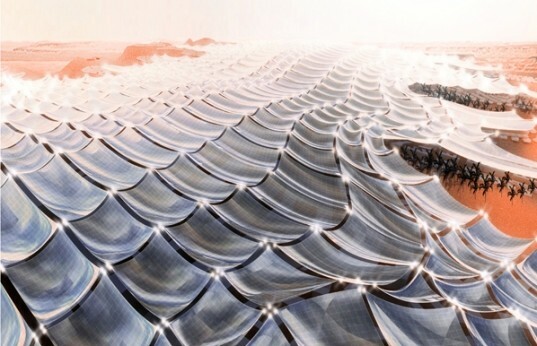 While the canopy has the potential to be a cheap and practical system for harnessing solar energy, the concept of placing a giant canopy over desert areas does raise a few questions.